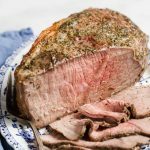 My Homemade Deli roast beef recipe will knock your socks off with how easy it is to prepare and cook, and the taste is far superior to deli beef you buy at the grocery store and without any added sugar or preservatives. I’ve shared the steps below for making this really simple deli lunch meat recipe, it’s the ultimate low carb and keto lunch option with zero net carbs. You can make keto sandwiches with my Low Carb Keto Bread or you can add it to a salad! Start by choosing the right cut of beef for this. 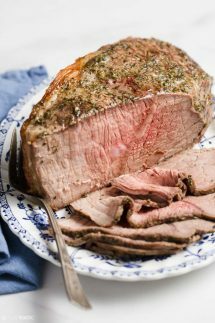 There are many economical cuts to choose from including bottom or top round roast, sirloin is also good but may cost a little more. Then finely chop the rosemary and add it to a bowl with the olive oil, garlic, salt, and pepper and mix well with the olive oil. Coat the beef on the top and on the fat cap with the deli beef marinade mixture and let the beef beef come to room temperature for an hour before roasting so that it’s not really cold in the middle. While you are waiting pre heat your oven to 325F and when you are ready to cook the meat for 60 to 95 minutes, or until an instant thermometer inserted into the center of the roast registers 125 to 130 degrees for medium-rare, or cook for a little longer if you don’t like it quite so pink. My meat shown in the picture was cooked to around 140F. I’m making it for my kids lunches and that’s as pink as they want to go but you can cook it exactly the way you prefer. so much better than store bought lunch meat! Easy to prep, you can cook it low and slow for about an hour to create tender, tasty, deli meat. 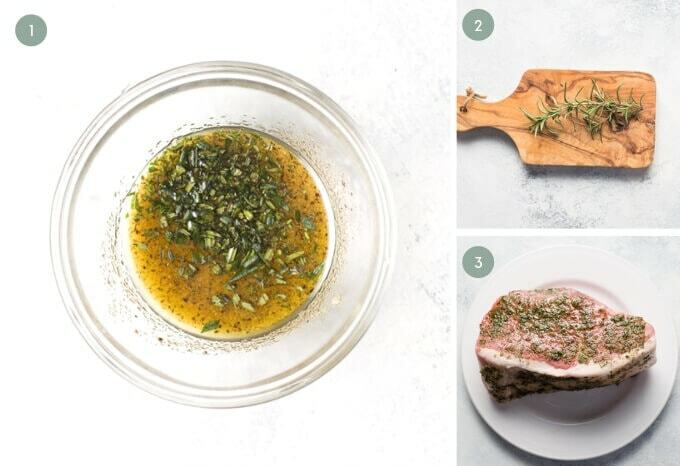 Finely chop the rosemary and add to a bowl with the garlic, salt, pepper and olive oil and mix well. Remove beef from fridge and spread the deli meat marinade evenly over the surfaces of the meat and then let it come to room temperature for one hour. Add the meat to the oven and cook for about 1 hour to 90 minutes, depending on the size of the roast and the temperature of your oven. 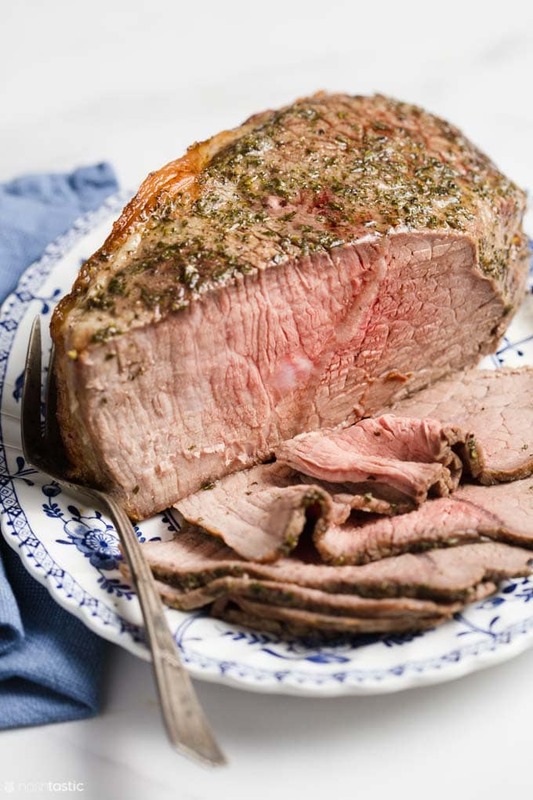 The only way to ensure that your deli roast beef is cooked the way you like it is to check the temperature of the meat rather than relying on timing alone. 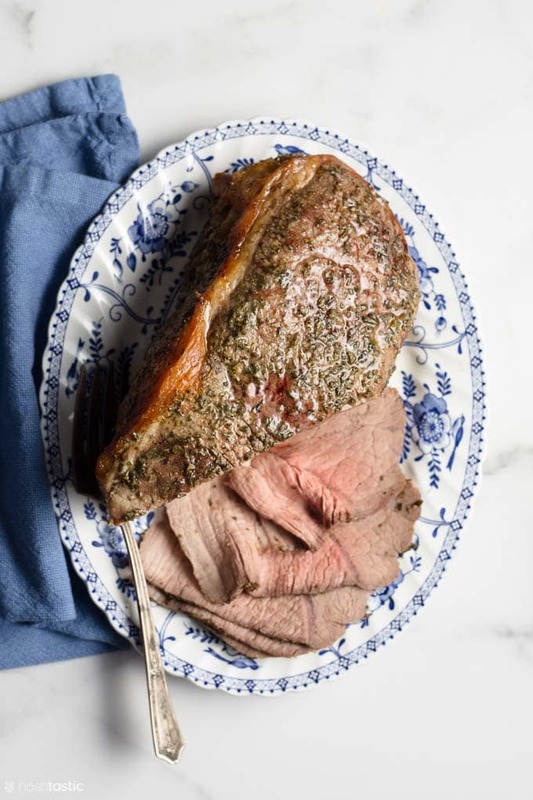 We use an instant read thermometer inserted into the middle of the roast to check the meat after about 50 minutes, you want 125F to 130F for medium-rare, or 135F-140F for medium. Let the meat cool completely before cutting into thin slices. If you are planning to eat it cold you might want to trim off any excess fat.